Bersih can stop but Hindraf will not stop unless UMNO stops 54 years of racism and religious extremism targeted against Indian poor. In the prelude to the 25th November 2007 Hindraf Rally, there was tremendous pressure on P. Uthayakumar and P. Waythamoorthy from the UMNO led government, Malay radical groups, Tiga Line Pekida gangsters and the Police Special Branch. There was a series of arrests and rearrests of the Hindraf lawyers and particularly targeting Uthayakumar who raised charges of ethnic cleansing. The sedition charge is still ongoing right to this date. During the one month in November and December 2007 alone Uthayakumar was arrested on three occasions with the fourth being his detention without trial under the ISA for 514 days. We were monitored and followed by the police round the clock and towards the end by fully tinted and unmarked police vehicles. 1,000 Hindraf activists were arrested and some 111 prosecuted for illegal assembly. The same albeit on far lesser scale took place again at the Hindraf Rally No. 2 against Interlok and UMNO racism on 27/2/11. One hundred over Hindraf activists were arrested right from Kedah, Penang, Perak, Selangor, K.L and N. Sembilan. 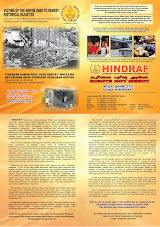 In March 2011 alone 54 Hindraf activists were prosecuted at the Ipoh, Selayang, K.L and Seremban Courts for merely being a member of Hindraf, the first of it’s kind. Besides the absolute monarchy Saudi Arabia, no world citizen has ever been prosecuted for being a member of an NGO. This is according to Front Line Defenders of Dublin. The ruthless and fascist UMNO regime abused the police force, the office of the Attorney General and the Judiciary to oppress and subjugate these Hindraf activists not to question their almost absolute rule and authority. We do not rely on the pseudo “multi-racial” PKR, DAP, PAS or the bi-racial Malay-sian civil society for support in championing the cause of the Malaysian Indian poor which they all have abandoned, unlike in the Western Civil Societies, as the Indian poor draws none or very little political mileage irrespective of the degree of their pain and sufferings resulting from the acts of UMNO racism and religious supremacy. And today we are prepared to go for broke and to go solo as our struggle does not go by the political mileage and/or the Malay muslim, natives and Chinese “majoritarian gallery” votes or whether we do or do not get the votes but will continue being the focus group championing the cause of the Indian poor. Unlike Bersih, Hindraf cannot and will not stop because of the 54 long years of the racist and religious supremacist UMNO segregating and excluding the Indian poor from the national mainstream development of Malaysia from womb to tomb. From being denied Birth Certificates to the “ethnic cleansing of Hindu cemeteries.